Mexico was selected to welcome the world’s leading teams and drivers back to our country, and everything is now ready for the highly anticipated FORMULA 1 GRAN PREMIO DE MÉXICO 2015®. The race will be legendary, as the 17th round of the FIA Formula 1 World Championship calendar after Austin in the United States. None of the current crop of drivers have competed on the Mexican circuit, so the race is the first opportunity to see them test their skills on the newly reformed and unexplored track. The new Autódromo Hermanos Rodríguez has the previous racetrack’s historical DNA enhanced with new technologies and a more modern design synonymous with many of the world’s best race tracks. The Grid Girls chosen from the most beautiful women of Nuestra Belleza Mexico are ready to take to the track, dressed in an exclusive Pineda Covalin dress as they mark the positions for the F1 and support race drivers. The support races: Masters Historic Racing and FIA Formula 4 are gearing up along with the thousands of Mexican race fans who have been anxiously awaiting the weekend ahead. Fun this weekend will not be limited to the track, as it will be packed with different activities for the whole family in various areas throughout the Autódromo Hermanos Rodríguez featuring first-class dining options, activities for children, official merchandise and special events with the Mexico Grand Prix ambassadors, such as Nigel Mansell, Emerson Fittipaldi, Héctor Alonso Rebaque, and Joe Ramírez. 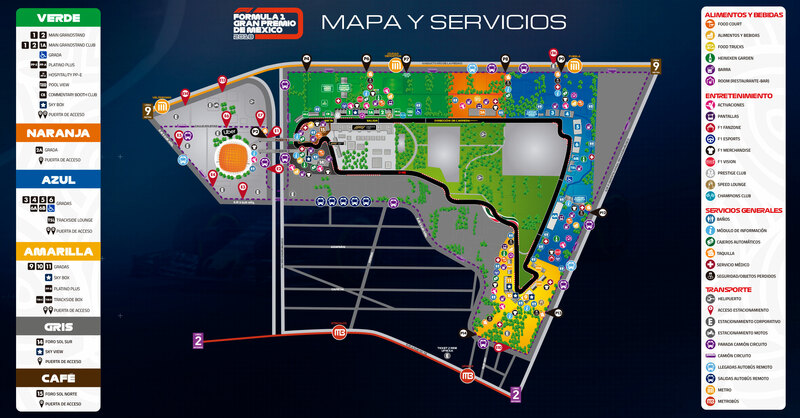 The FORMULA 1 GRAN PREMIO DE MÉXICO 2015 to be held at the Autódromo Hermanos Rodríguez will be accompanied by the F1 FanZone CDMX to be held simultaneously at Chapultepec Park. The F1 FanZone will feature a variety of activities for the whole family, such as simulators, go karts and driver autograph signing sessions, and giant screens with live broadcasts of the race and qualifying sessions. Polanco will host the Formula 1 party celebrated worldwide, by transforming the streets into a pedestrian zone with flags featuring car shows, simulators and many other activities, and the terraces of the main restaurants in the area serving commemorative F1 dishes for a truly unique experience. Formula Polanco will be set on Emilio Castelar Street throughout Lincoln Park and framed by Virgilio Street. The famous exclusive VIP Amber Lounge will transform the traditional Campo Marte Casino into an impressive and unique club created to welcome a large number of special guests including celebrities, politicians and socialites to spend time with the Formula 1 teams and drivers. All of this will be accompanied by live artist performances and world-class DJs, an international fashion show with super models and unlimited drinks until dawn. Only four countries are lucky enough to host this special party: Monaco, Singapore before coming to Mexico City, and will close this Formula 1 season with the after party at the last race in Abu Dhabi. It took 23 years for Mexico to get back on the Formula 1 Grand Prix calendar, so all roads will lead to the Autódromo Hermanos Rodríguez this coming October 30 and 31, and November 1 with its ten teams and 20 drivers from across the globe, and the more than 110,000 fans that will gather to witness this unique event in Mexico City. Travel and enjoy Mexico with the FORMULA 1 GRAN PREMIO DE MÉXICO 2015®. We are the market leader in outdoor entertainment in Mexico, Colombia and Central America and one of the major players in the entertainment industry in Latin America and across the globe. CIE offers a variety of world-class entertainment options including concerts, theater productions, and sports and family and cultural events, among others, to meet our market segments’ needs for recreation and entertainment through its unique vertical integration model that provides the only access available to an extensive network of entertainment centers, advertisers including the principal advertising investors in our markets, and partnerships and strategic alliances with experienced global partners. We operate an amusement and water park in Bogota, Colombia, and manage Centro Banamex in Mexico City, one of the largest convention and exhibition facilities across the globe. We are recognized as the foremost producer and organizer of special and corporate events in Mexico, and we operate one of the most professional contact centers in the Mexican market. CIE is a public company whose shares and debt securities are listed on the Mexican Stock Exchange.